After a full night of giggling and snoring, giggling and snoring, (repeat) ...Gavin woke up rested and smiling. And still giggling. To say that he loved his first night in his new bed would be an understatement. Today he gave his brother a tour and had him into HIS bed to play for a change! Brian thought the whole experience was hysterical. 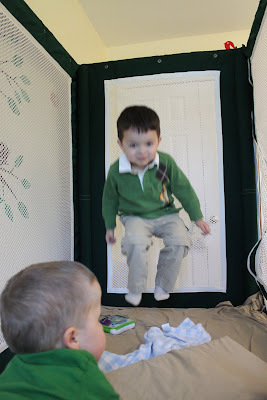 Especially when Mommy crawled in and we closed up the net "door". 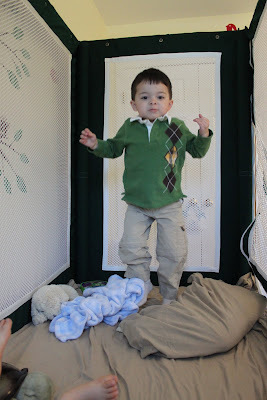 And especially especially when he realized it was an awesome bed for jumping!! I think Gavin was worried that he'd lose his bed to the resident monkey. Next week begins Brian's "Spring Break" - and Gavin's break from therapy, too. I realized today that from now on we are sort of at the mercy of school breaks! If we want to plan any vacations and it's not on an official break - we may have to break some rules! 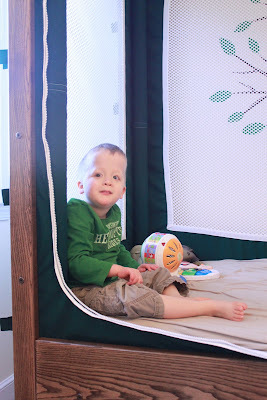 It gets tricky when you have a child in special education - or therapy like Gavin. There isn't a "summer vacation" - there's only a short summer break. Brian will still attend school...and Gavin will still have therapy at the house. So planning anything (if we're good and obedient parents) will have to fall on the scheduled spring or summer break. Today was another rough one for me. So frustrating! I don't know how to explain it any other way than this... I'm very "aware" of every inch of my body. My skin...my fingers...my feet...my calves...everything. It feels like someone is squeezing me from the inside - everything just throbs. It's bizarre. I was able to squeeze in a Dr. Trish appointment today, which was great. At the end of our session she said it was like my nerve endings were all exposed - like a frayed wire that needed to be resealed. So that's just what she did. I'm so grateful to be back with Dr. Trish. I know I'll have this crazy body back in sync in no time. Hopefully just in time to be pregnant!! If you're wondering...we have a tentative date of April 9th (give or take a day or two!) for the embryo transfer. We're moving right along!